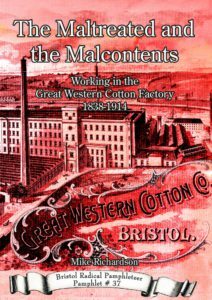 These pictures were found in Bristol Central Reference Library and they should be consulted if you wish to reproduce them (refandinfo@bristol.gov.uk). 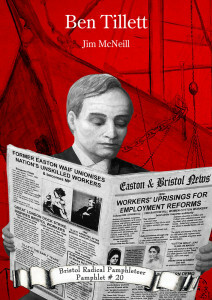 The dispute opened on 5 November 1892, when Bristol timber merchants hired non-union labourers to work alongside Dockers’ Union members. 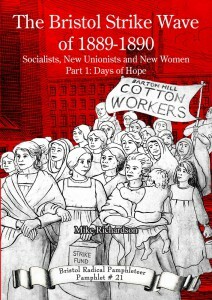 This was viewed by the men as the thin end of a wedge; if the employers could open the closed shop, as for example in Cardiff, then the union’s power would be broken, since there was always a surplus of labour. Consequently, they walked off the job, submitting their grievances to the local industrial arbitration board. The employers, however, refused to discuss the matter. Instead, they contracted with a representative of the Shipping Federation, Graham Hunter, to procure black-leg labour, declared a lock-out, and would not allow the men to return to work without the Shipping Federation ticket. The bulk of Bristol’s dockers responded by downing tools. At this point, the local union officials realized they were out of their depth and wired to London. On 17 November, Tom McCarthy arrived in Bristol to assume command of the strike. Six days later the ftrst blacklegs appeared. Feeling ran high: the following evening, when Graham Hunter’s train came in, he was met at the railway station by an angry crowd armed with sticks. Truncheon-wielding police were needed to rescue him and to disperse the men. 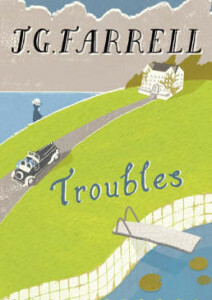 [Ben] Tillett arrived the next day. Ben Tillett: Portrait of a Labour Leader by Jonathan Schneer, Taylor & Francis, 1982 p 80. The Christmas lantern procession took place in Bristol on the evening of 23rd December, 1892 and attracted hundreds of Christmas shoppers. There was a crowd of about 20,000 people in the Horsefair in the centre of Bristol. A brass band played “Rule Britannia”, speeches were delivered urging calm and orderly conduct in spite of, or perhaps because of, the presence nearby of Dragoon Guards and Hussars who had been called in from Aldershot, Hampshire. The City Council and the police were expecting a possible breach of the permit-restrictions they had imposed on the route of the procession and on the use of lanterns, and were determined to enforce their regulation. 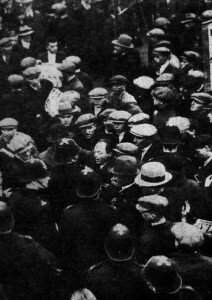 One or two leaders of the demonstration were arrested after the speeches, and the police line which blocked the route over Bristol Bridge was broken through by determined demonstrators. It was then that the cavalry were called to break up the demonstration and drive everyone off the streets. 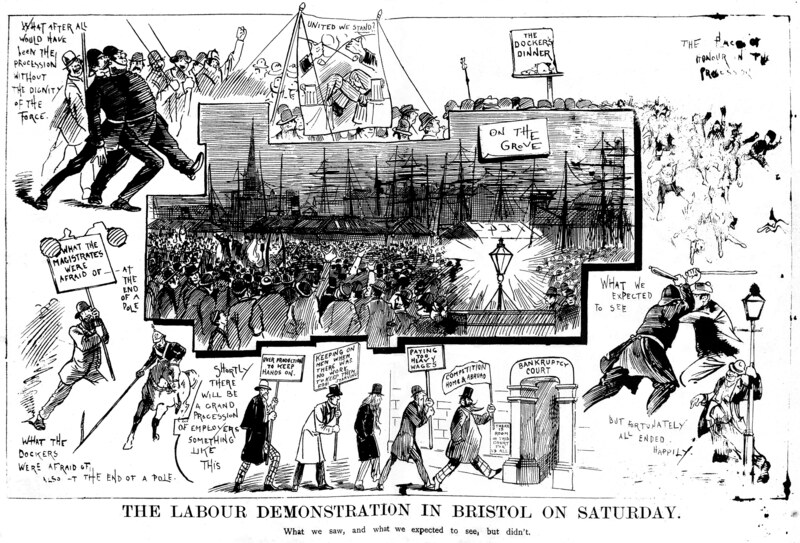 They charged shoppers and demonstrating workers alike, pursuing them through the centre of Bristol. Fifty-seven Bristolians, many suffering head injuries from the cavalry’s sabres and batons, and fifty-one police were injured. [Ben] Tillett and the demonstration’s organisers were later charged with sedition: inciting the violence of what became known as ‘Black Friday’. 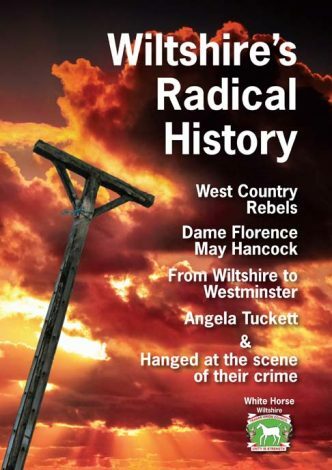 The demonstrators and organisers who were tried in Bristol were convicted and imprisoned, by courts whose magistrates included a high proportion of employers and other people with prejudicial interests. These included Charles Wills, who had ridden with the military and had ordered the cavalry charge. The City Council voted out a proposal to hold a public enquiry into the event. Tillett, because of his access to London lawyers, was able to have his case heard at the Old Bailey in London. 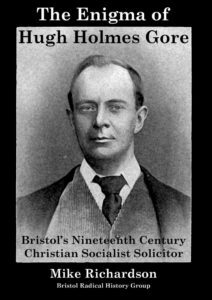 After a trial which brought nationwide publicity for the attacks on the Bristol demonstration and for the labour movement, Tillett was acquitted and received a hero’s welcome when he later returned to Bristol. From Bristol Radical Pamphleteer #20 Ben Tillett by Jim McNeill. 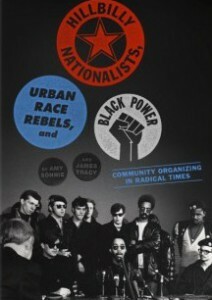 The Late Riots. Sketches In Court. 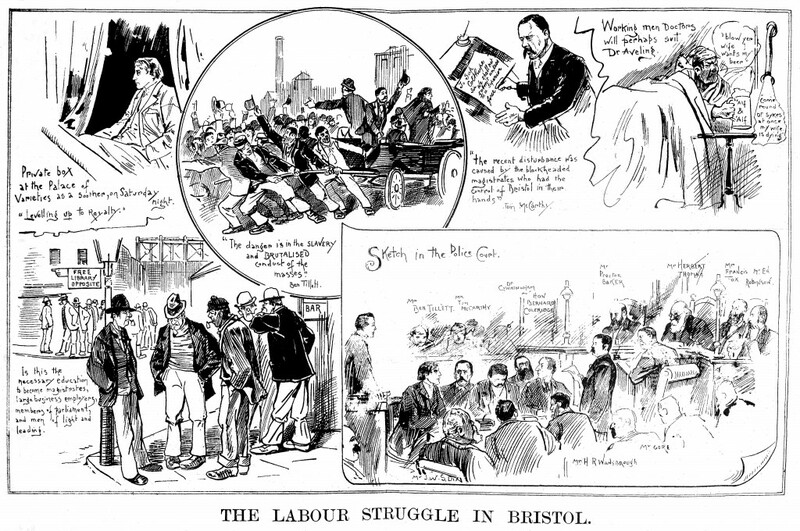 The Bristol Magpie Saturday 7th January, 1893. A Lesson For Intelligent Workers. The Bristol Magpie Saturday 14th January 1893. See the text below. Sir Charles Wathen was a wool merchant who was Mayor of Bristol six times. 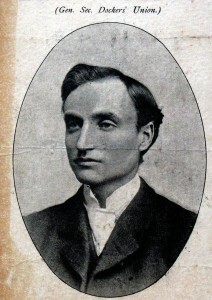 Sir Charles Warren was military officer, archaeologist and the ‘Commissioner of Police of the Metropolis’ during the Jack the Ripper murders. 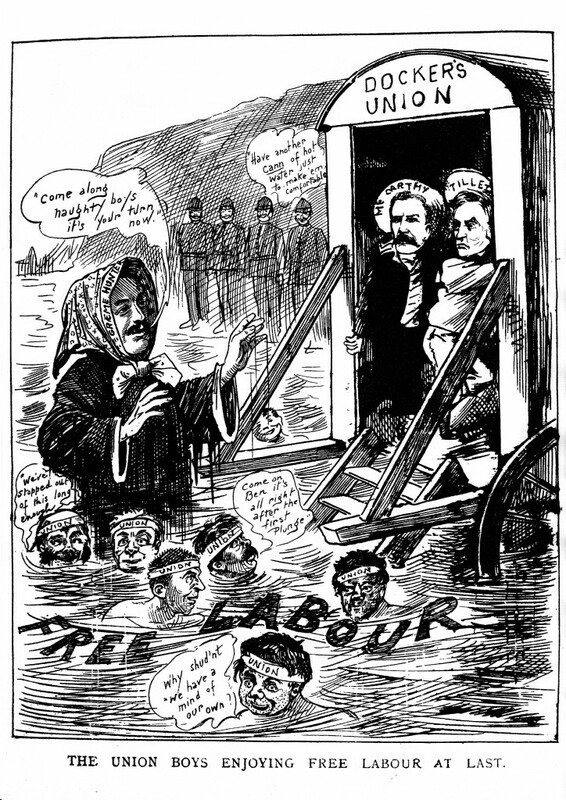 The radical press completely turned against him after Bloody Sunday on 13 November 1887, when a demonstration in Trafalgar Square was broken up by 4,000 police officers on foot, 300 infantrymen and 600 mounted police and Life Guards [Wikipedia]. 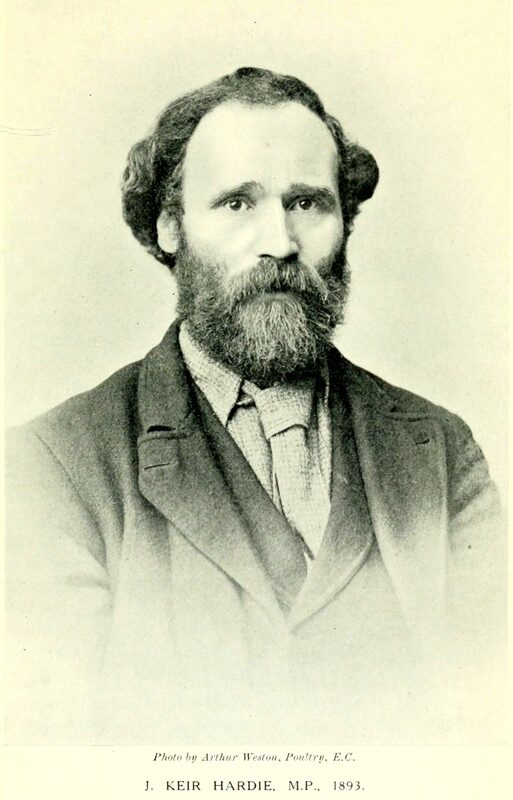 Edward Bibbins Aveling (29 November 1849 – 2 August 1898) was a prominent English biology instructor and popular spokesman for Darwinian evolution and atheism. 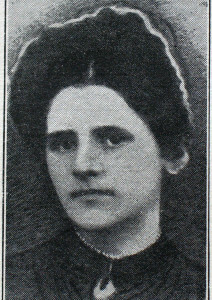 He later met and moved in with Eleanor Marx, the youngest daughter of Karl Marx and became a socialist activist. 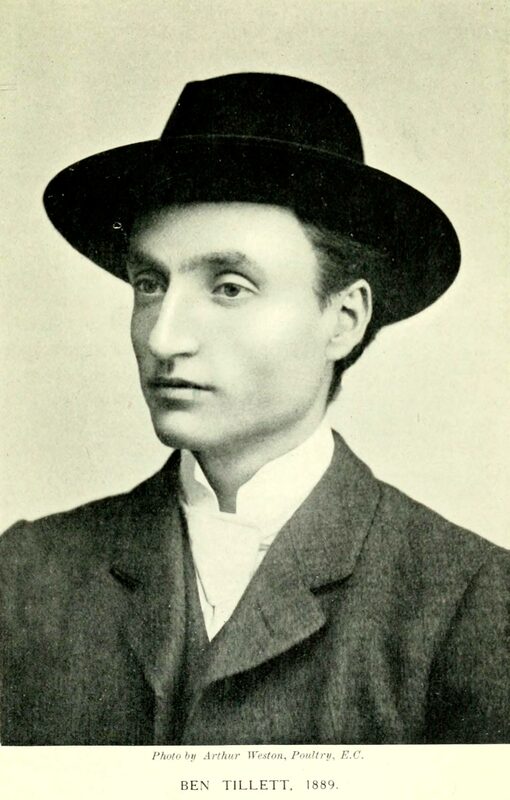 Aveling was the author of numerous books and pamphlets and was a founding member of the Socialist League and the Independent Labour Party [Wikipedia]. Tillett was accorded a hero’s welcome when he returned to Bristol on 7 January for the preliminary hearing. 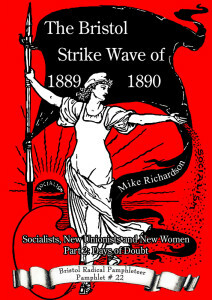 He was met at the railway station by a brass band, and his carriage was unhitched and drawn through the streets by enthusiastic well-wishers… And the next day, despite a storm of snow and sleet, an estimated five thousand turned out to hear him promise again that: …”It must not fmish at trades unionism -it must not finish until the workers of all grades and degrees commanded absolutely the whole machinery of the state, the whole machinery of government, of production, control and distribution.” …. Significantly Edward Aveling, Eleanor Marx’s common-law husband, stood by Tillett’s side on the platform, and addressed the crowd when the dockers’ leader had finished. 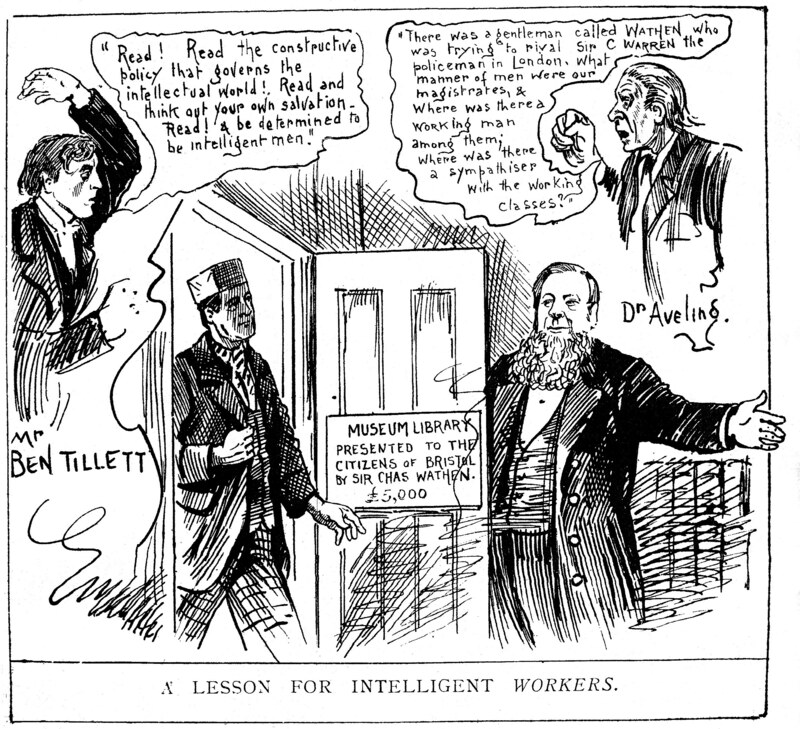 Yet Tillett’s conversion to Marxist principles, if it may be classified as such, was short lived. 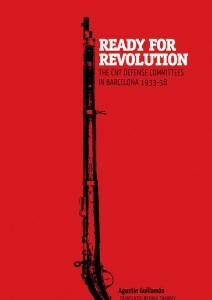 He had no sooner left Bristol than he began to play down both his militancy and his socialism. Ben Tillett: Portrait of a Labour Leader by Jonathan Schneer, Taylor & Francis, 1982 p 85. Labour Struggles In Bristol. 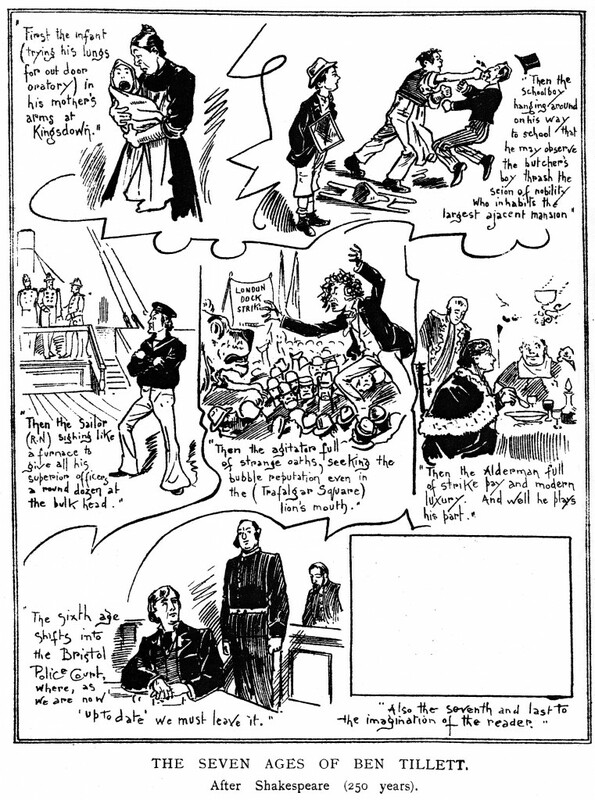 The Bristol Magpie Saturday 14th January, 1893. Seven Ages of Ben Tillett. 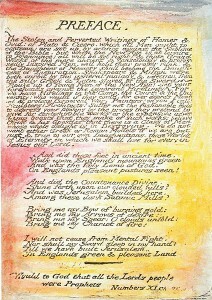 After Shakespeare (250 Years). The Bristol Magpie Saturday 21st January, 1893. From The Bristol Magpie. Saturday 11th February, 1893. 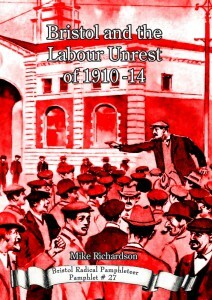 Labour Demonstrations In Bristol On Saturday. What we saw, and what we expected to see, but didn’t. 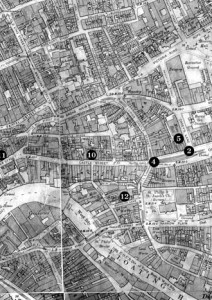 The Bristol Magpie Saturday 11th February, 1893. 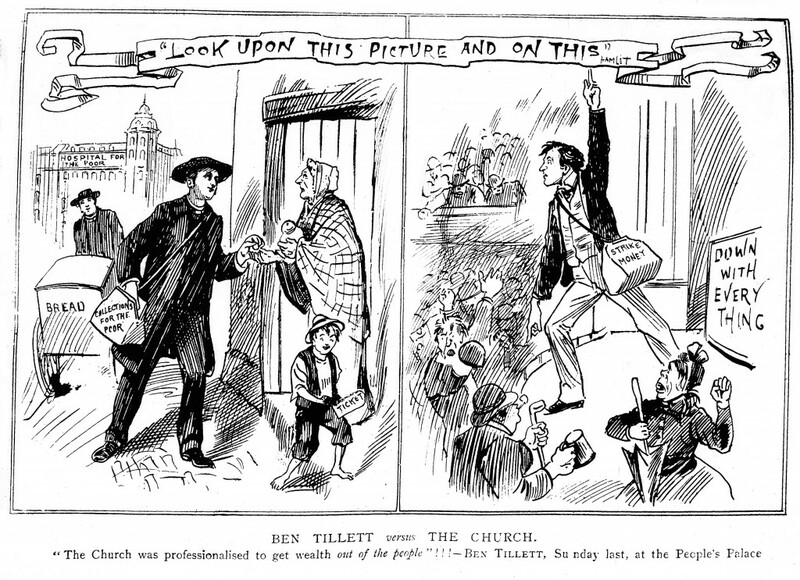 Ben Tillett Versus The Church. “The Church was professionalised to get wealth out of the people”!!! – Ben Tillett, Sunday last, at the People’s Palace. The Bristol Magpie. Saturday 4th March, 1893. Graham Hunter v. Tillett & McCarthy. “I ask any man who has the slightest knowledge of the work, and the physique of Tillett, MacCarthy, and myself, to picture us separately under a 24 x 11 x 4 deal – at least two of the appearances would be burlesque. No man in my employment is asked to do work which I personally could not accomplish if in his place” – Graham Hunter. The Bristol Magpie. Saturday 18th March, 1893. 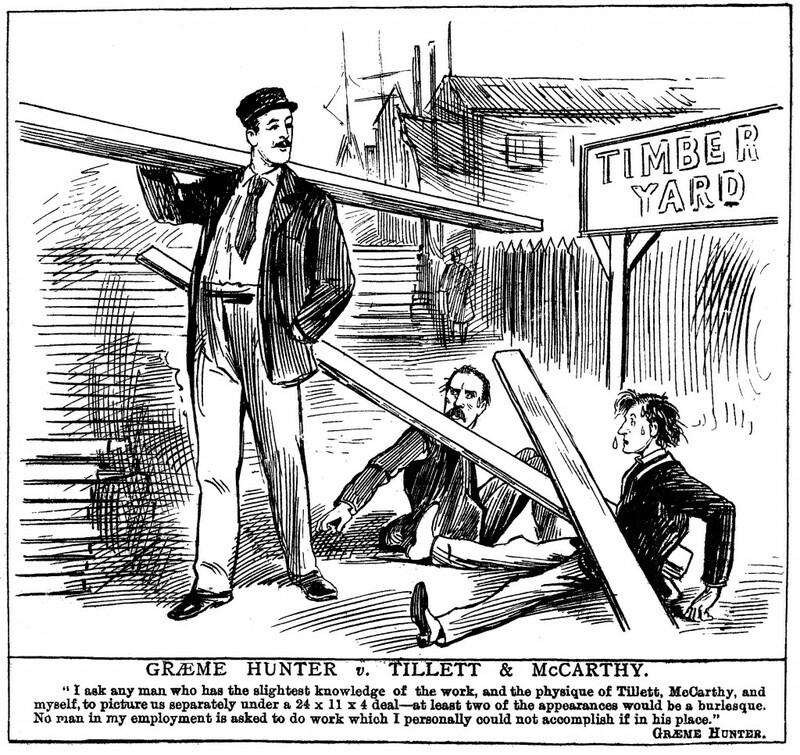 Graham Hunter had organised black-leg labourers to break a strike in November 1892. Tom McCarthy was the leader of the Amalgamated Society of Stevedores. Ben Tillett was Alderman of London County Council and a dockers’ union leader. 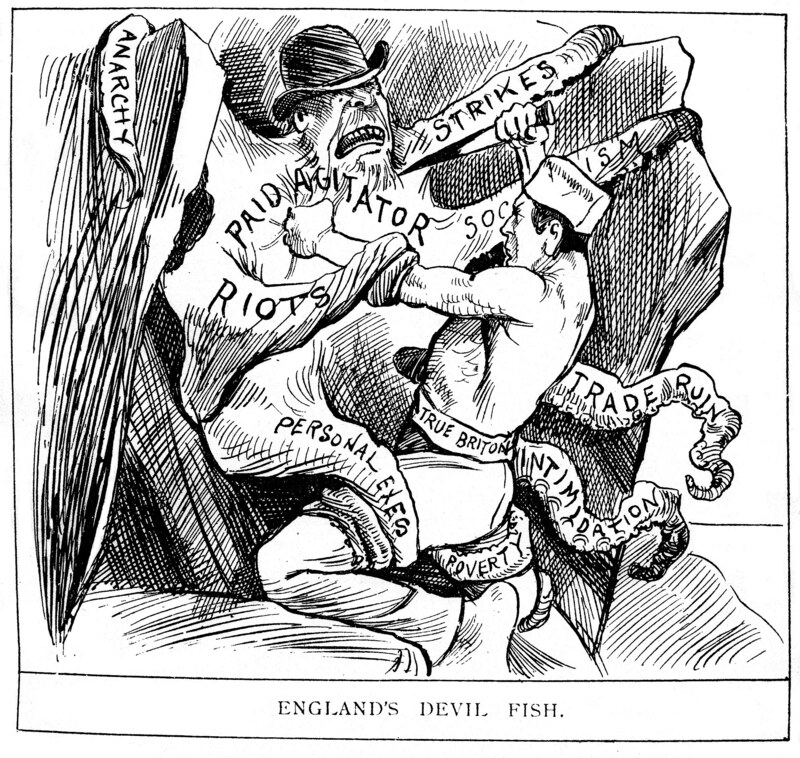 The Great Strike. Death To British Trade And Commerce! The Bristol Magpie. 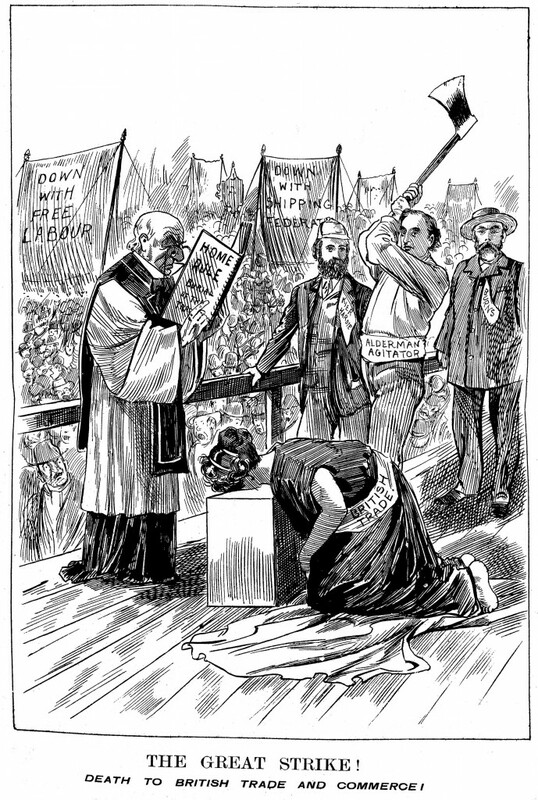 Saturday 22nd April, 1893. Ben Tillett is labelled “Alderman Agitator”. 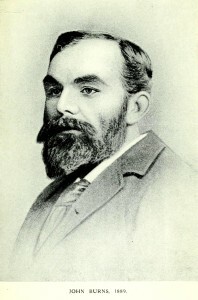 Kier Hardie was the Independent Labour Party MP for West Ham South and John Burns was the Independent Labour Party MP for Battersea, both were elected in 1892. England’s Devill Fish. The Bristol Magpie. Saturday 29th April, 1893. 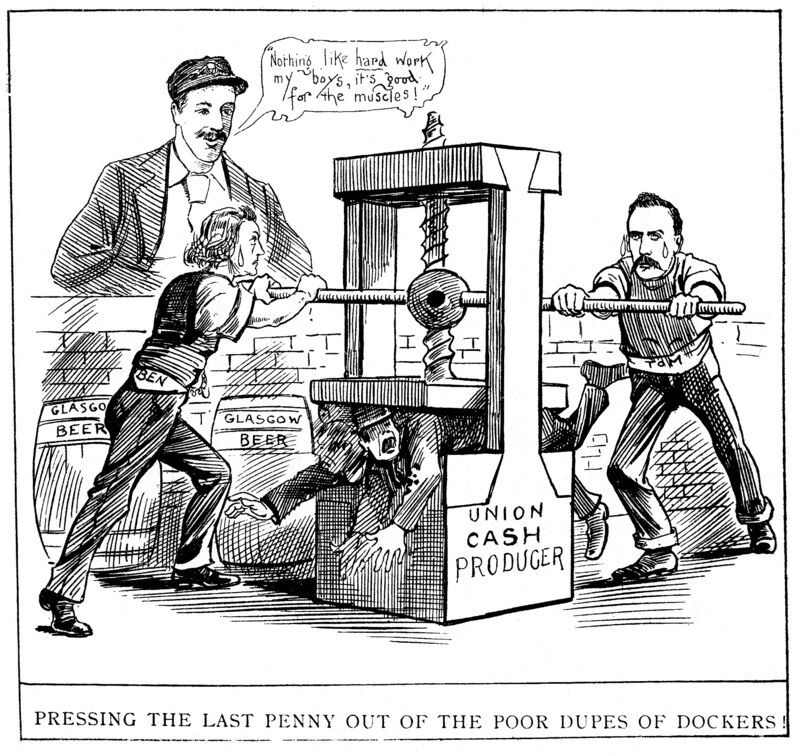 Pressing The Last Penny Out Of The Poor Dupes Of Dockers! The Bristol Magpie. 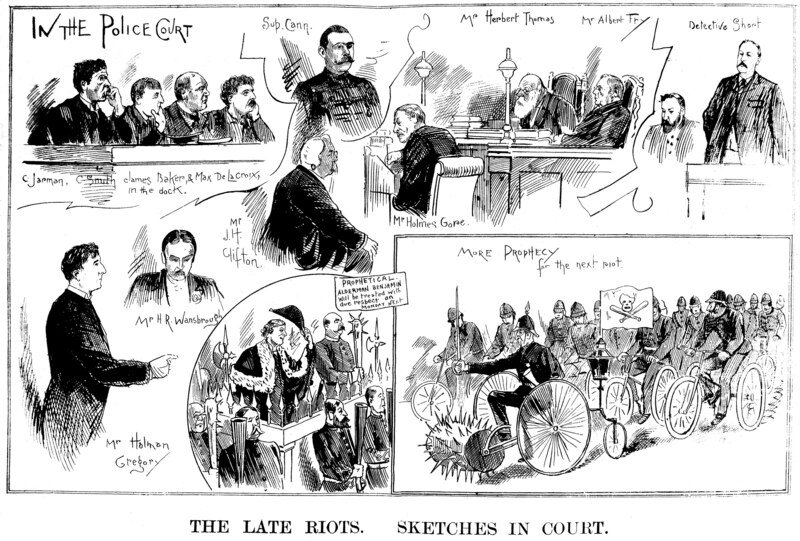 Saturday 6th May, 1893. The Union Boys Enjoying Free Labour At Last. The Bristol Magpie. Saturday 10th June, 1893. The dockers had to concede defeat in the spring of 1893.